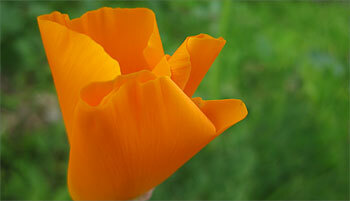 The top picture is one of the first California poppies to come back this year. They seem to reseed with abandon, so I haven’t had the chance to try to grow them from seed myself. Recently I was given some seeds, so I will have to try starting them in a area that’s protected from the cats. The calla lillies are finally open, and I’ve been pulling them, giving them away and keeping in water by my desk. This is another “do absolutely nothing” plant, I do appreciate that. 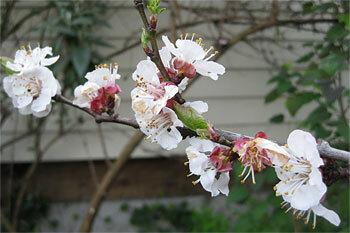 The apricot tree is blooming, I hope I get some nice apricots this year. And so is the camellia that’s been blooming for months now. 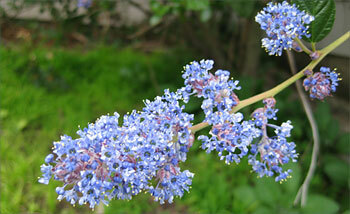 I like the way I can keep track of how long the blooms last with this blog. Borage, which is everywhere is just starting to bloom, and I couldn’t resist adding this magnolia, which isn’t in my garden, but is right down the street. 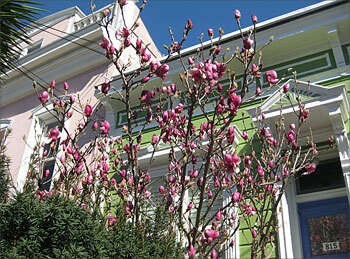 Garden Blogger’s Bloom Day is brought to us by May Dreams Gardens. Yay! Hi i am new here, saw your is GBBD. Among all the temperate countries flowers mostly posted in the joiners, it is your calla lilly which we also have. They grow only in some of out highest elevations only. But this one you posted looks so thick and not delicate, as if it is a piece of fiberglass! BTW, i am from the tropics. Hi Andrea. 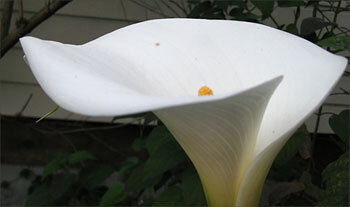 These calla lilies aren’t too delicate, here in San Francisco they can go a little crazy. I didn’t plant them, they just come up every year, sometimes they get a little out of hand and I need to dig them up. 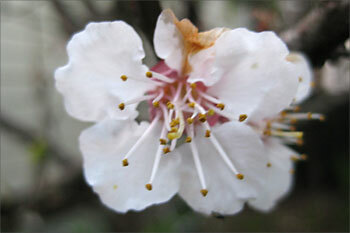 Not quite fiberglass though, the flower itself is still pretty soft and velvety. I’m jealous of your orchids and mango trees! Here it gets really dry during the dry season, so most of the plants in my garden have low water needs (except for veggies). This was a plant I took for granted until it disappeared for a couple of years after some overzealous weeding, and then I found myself feeling happy when it returned. It’s funny how something which can seem so common in one part of the world is rare somewhere else.